Dr. Jamil Aboulhosn and Richard Whitaker hold the model, which doctors used to test the valve replacement in advance of the procedure. ​​Last summer, after a long career as a successful entrepreneur and a brief retirement, Richard Whitaker was helping to start another new company. Unfortunately, a serious health concern caused a couple of interruptions in his work on the new venture. One of Whitaker’s heart valves wasn’t working properly, which caused congestive heart failure and led to two hospitalizations within several months. Whitaker, now 66, needed surgery to replace the valve, which regulates the blood being pumped from the heart to the lungs. But previous surgeries and the unique anatomy of his heart would have made conventional open-heart surgery too risky. UCLA cardiologists decided to use a less invasive approach to replace the valve. Given the unique structure of Whitaker’s heart, the team took the added steps of printing a 3-D model of his heart that could be used for practice before the actual procedure. The key question they needed to answer was whether a replacement valve would align and fit with Whitaker’s unusually large pulmonary arteries. “We are harnessing the latest technologies such as 3-D printing to help us better address the most complicated cases,” said Dr. Jamil Aboulhosn, director of the Ahmanson/UCLA Adult Congenital Heart Disease Center and the Streisand/American Heart Association Endowed Chair in the Division of Cardiology at the David Geffen School of Medicine at UCLA. The 3-D model, which was created using a CT scan of Whitaker’s heart, was made of a silicon-like material with properties similar to tissues and other structures in the heart. 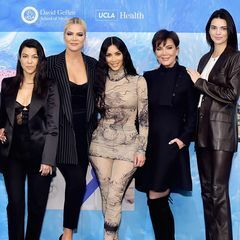 The UCLA team specified what areas of the model would be made from a harder material to simulate calcium deposits, and softer material, to represent heart muscle and vascular tissue. 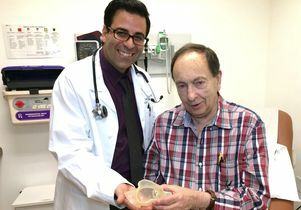 Dr. Jamil Aboulhosn (left) and Dr. Daniel Levi, holding the 3-D model. 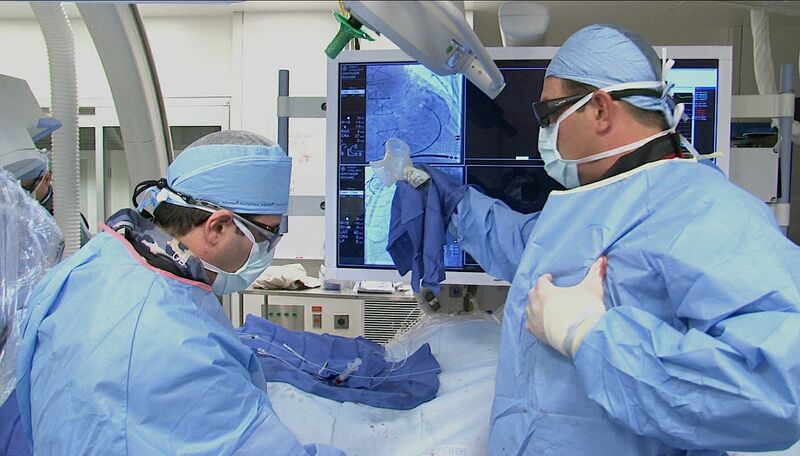 Aboulhosn worked on the test run with Dr. Daniel Levi, a pediatric cardiologist and director of UCLA’s congenital interventional catheterization laboratory, and Dr. Morris Salem of Kaiser Los Angeles. The doctors guided a mesh-like stent into place, where it acted as scaffolding to hold the valve, and then guided the tightly packaged valve into the model. Once the valve was in place, the doctors opened it and found that it was a perfect fit. Having practiced on the model, doctors performed the real procedure on Whitaker at UCLA in mid-May. 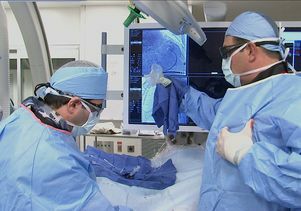 They guided the valve and stent up to the heart through a small vein in the groin using a small tube called a catheter — the typical delivery system for this type of minimally invasive procedure. As soon as the valve was placed and deployed, it began to work instantly. Just four days after the procedure, Whitaker was able to go home from the hospital. “I didn’t miss a beat and was able to get back to my life quickly,” Whitaker said. The pulmonary valve is one of four major valves in the heart. When it doesn’t work effectively, it can cause the congestive heart failure symptoms that Whitaker had been experiencing, including fluid build-up, irregular heart rhythms and kidney issues. Whitaker had a pulmonary valve replaced in 1996. Aboulhosn said that pulmonary valves typically last between 10 and 20 years, so the need for a replacement was expected. Levi said improved technology is making 3-D printing an increasingly important tool for doctors. Whitaker plans to continue enjoying the challenges of his work; he’s currently helping a friend start a cleaning business for commercial and medical buildings. And, after a trip with his wife to Italy last year, he’s looking forward to seeing more of Europe. The model of Whitaker’s heart was created by Materialise, a provider of 3-D printing software and services. 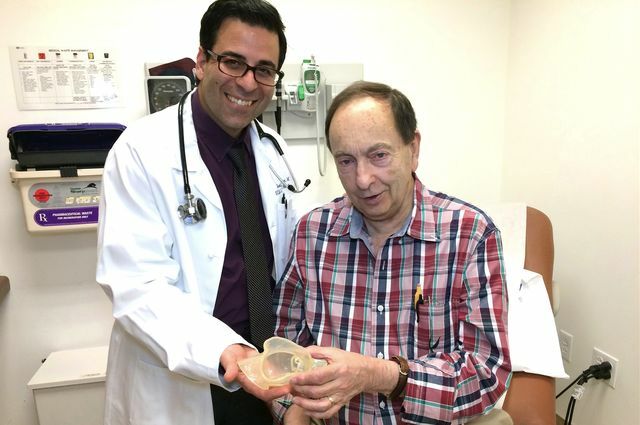 Dr. Jamil Aboulhosn and Richard Whitaker with a 3-D printed model of Whitaker’s heart.